What is your specialty? Jewelry made of clay, glass, metal, leather and wood. “Crafting has been a part of my life since I was a child. 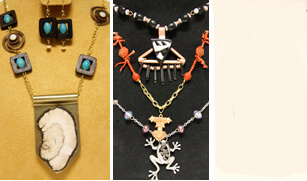 Today, my main interests are stained and fused glass, silversmithing, pottery, lapidary, and jewelry design. I often use all of these skills in the jewelry I make. “Finding unusual ideas for jewelry is fun. My designs come from many sources: a design in fabric, a piece of gnarled wood, a texture from a spackled wall, or the shape of a cactus flower. I use different kinds of beads in necklaces, bracelets, earrings and other jewelry. Working with unusual colors, shapes, sizes and textures is fun–and a challenge. “I started making jewelry from fused glass and wire, thanks to my friend Rose Young . I fought her off for several months but finally gave in to her constant harassing. I’m glad I did because it’s the most relaxing way for me to spend retirement–next to playing the ukulele.